The Medical Design Excellence Awards 2018 finalists demonstrate trends toward patient risk reduction and faster, more-efficient healthcare delivery as well as connectivity and user-focused, consumerized healthcare. For the past 20 years, the Medical Design Excellence Awards have celebrated medical products that improve the quality and accessibility of healthcare. Our finalists this year carry on this tradition, while also keeping in step with today’s high-tech digital and consumer trends. With the help of our esteemed jurors, we have identified four key trends in this year’s group of finalists: risk reduction; faster, more-efficient healthcare delivery; the influence of the Internet of Things; and the consumerization of healthcare. We’ve been tracking a few of these trends in past awards programs, so they’re not necessarily new. In fact, when we launched the program in 1998, we noted a trend in the very first group of MDEA finalists toward “meaningful focus on the patient.” This year’s group of finalists are just as focused and may very well be addressing unmet needs in their respective categories. In this article, we cover a few of the trend-setting finalists; for the complete list, click here. 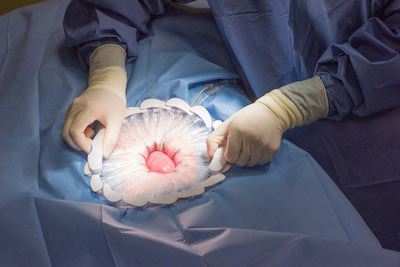 Medical devices enable doctors and nurses to save and sustain lives every day, but invasive procedures can present risks of infection and trauma. Many finalists this year aim to minimize those risks. The CleanCision wound retraction and protection system (below) for use during abdominal surgery aims to consistently and continuously irrigate the wound edge with a surgeon-selected fluid therapy to actively fight and remove the root cause of surgical site infection—wound contamination—without disrupting current surgical practice, Prescient Surgical explained in its submission. Many finalists are attempting to speed up healthcare screening and procedures, which can benefit patients, clinicians, and healthcare systems. 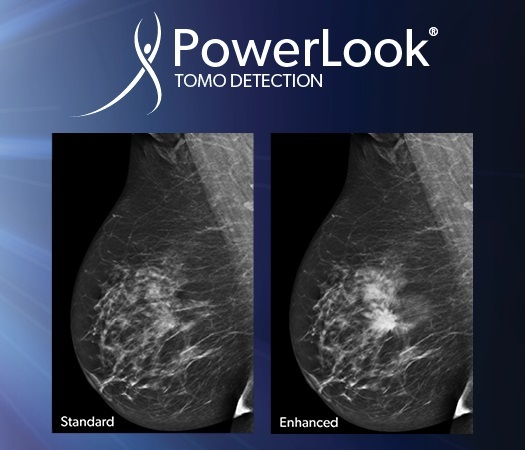 PowerLook Tomo Detection. Image courtesy of iCAD Inc.
For head and neck imaging, the portable OmniTom 16-slice CT scanner could be used by a single operator. Samsung NeuroLogica claims that the system offers rapid scan time and immediate image viewing of high-quality, noncontrast CT angiograph and CT perfusion scans at the point-of-care. Submitted in the Implant and Tissue-Replacement category, the GRYPHON Anchor with PROKNOT Technology is a pre-tied knot for loading onto the GRYPHON Anchor for shoulder and hip repairs. 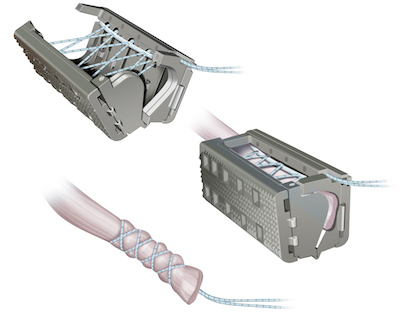 The product is 64% smaller than traditional arthroscopic knots and is more consistent than arthroscopic knot-tying due to requiring only one half hitch, according to the submission from Johnson & Johnson Medical Devices Companies. “A simple half-hitch stich and anchor combo eliminates steps in a traditional repair procedure,” said Chacon. The Alinity s Series blood and plasma screening instrument aims to improve the testing efficiency of blood and plasma donations to screen for infectious diseases. Juror Andra Blomkalns, MD, believes it “could allow for the more rapid delivery of pathogen free blood needed for emergent transfusions by rapidly testing samples for disease like HIV and hepatitis.” Blomkalns serves as vice chair of academic affairs and business development, Department of Emergency Medicine; and medical liaison to the Office for Technology Development, UT Southwestern Medical Center. Even faster product sterilization times could offer healthcare benefits. The STERRAD VELOCITY is a hydrogen peroxide biological indicator (BI) system that confirms proper sterilization of reprocessed surgical instruments within 30 minutes, reported Advanced Sterilization Products, part of Johnson & Johnson Medical Devices Companies. “Rapid, 30-minute BI readings are a huge win for the hospital system,” said Thielman. The StealthStation S8 visualization and surgical navigation system, designed for cranial, spine, and ear-nose-throat procedures, allows users to track several instruments in real time using optical and electromagnetic localization technologies. The system offers wireless connectivity to hospital and medical devices, allowing the import and export of exams from anywhere within the hospital network, Medtronic reports on its Web site. To maintain cybersecurity, users can define the level of security for user authentication, antivirus protection, encryption, and firewall protection. The Sofia 2. 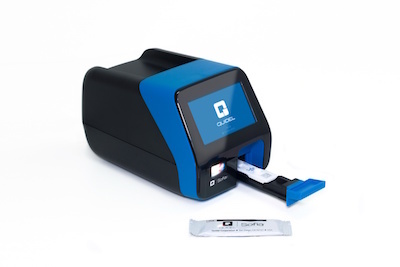 Image courtesy of Quidel Corp.
Devices used outside healthcare settings are increasingly becoming connected. For instance, the MoMe Kardia electrocardiograph monitoring wearable continuously streams data to the cloud. Blomkalns called it a “novel, sleek, heart rhythm monitoring wearable with three modes (Holter, event, and mobile cardiovascular telemetry). Positive attributes include non-intrusive design, ease of use with simple display and sound prompts, [and] wireless transmission of HIPAA compliant cloud based data accessible to care providers remotely.” The system’s design may also help overcome user struggles. Jurors stated that it is “hard to find an easy-to-use monitor for patients—the leads come off.” Such utility could ultimately make a difference, as “Thousands of patients go undiagnosed,” said Wehde. Entered into the Rehabilitation and Assistive-Technology Products category, the Podimetrics Remote Temperature Monitoring System for monitoring inflammatory foot diseases such as foot ulcers employs a “telemedicine mat” and an online portal for clinical decision support, Podimetrics Inc. stated. The system provides a compliance indicator that lights up and then generates a phone call if needed, jurors observed. The system has a “great form factor and integration of electronics/algorithms,” noted juror Eric Richardson, associate teaching professor at Rice University. Copeland saw among the finalists evidence of the consumerization of healthcare products in interfaces and touchpoints, while Blomkalns noted a trend toward allowing patient to do things at home. 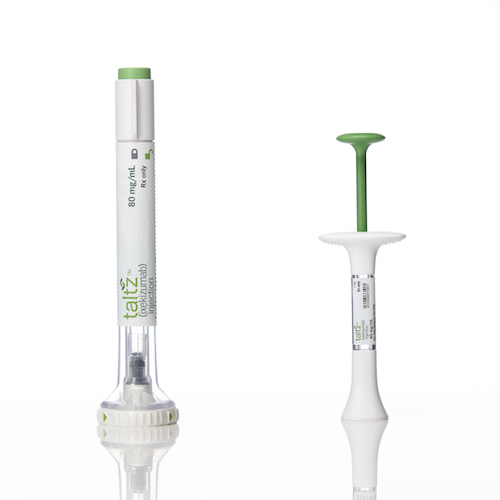 Taltz Injection Devices. Image courtesy of Eli Lilly and Co.
To hear the Gold, Silver, and Bronze MDEA winners as well as the Best in Show winner announced, join us June 12 at the Jacob K. Javits Center in New York City. We’ll host a pre-ceremony cocktail reception at 4:00 PM in Room 1E15 - 1E16 and then we’ll start the show! The ceremony is open to all attendees of Medical Design & Manufacturing East, held June 12-14. Click here to register for the show. Click here for a complete list of all 2018 finalists and images. For trends among last year's finalists, please see our May 2017 feature, "The 4 Essential Elements of Device Design Today." Daphne Allen is editor-in-chief of MD+DI. She previously served as executive editor of Pharmaceutical & Medical Packaging News, which serves as the pharmaceutical and medical device channel of Packaging Digest. Daphne has covered medical device manufacturing, packaging, labeling, and regulatory issues as well as pharmaceutical packaging and labeling for more than 20 years. She is also a member of the Institute of Packaging Professionals's Medical Device Packaging Technical Committee. Follow her on Twitter at @daphneallen. What Do Physicians Need from Medtech?